I love St. Valentine’s Day! It’s probably one of my favorite ‘holidays’…if you can call every February 14th, ie Valentine’s Day a HOLIDAY. 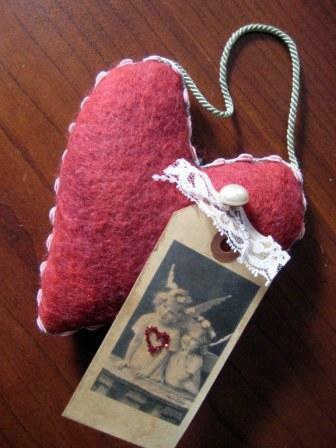 Besides sheep, hearts are my next best ‘motifs’ to play with. Does that make me a hopeless romantic? So, I whipped up these two lavender/flax-filled sachets today. 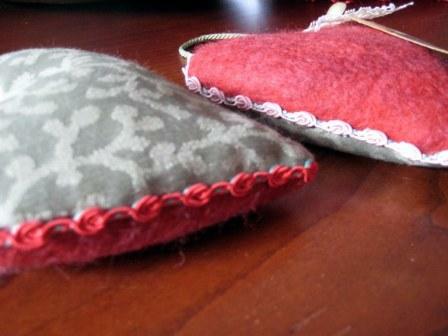 They’re both made with my hand-dyed, hand-felted wool on the one side and a green satin print fabric for the back. 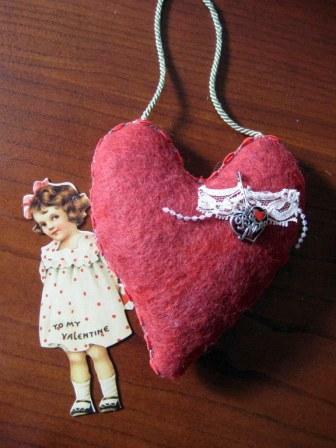 I hand-stitched rosebud trim around the perimeter, added a green cord for hanging, and added snippets of lace, bead trim, tea-stained tag, vintage button or/valentine charm to sweeten them up. I have lots more ‘hearts; to make…fun, fun, fun! So, what are you waiting for?? ?